The RP Photonics Buyer's Guide contains 10 suppliers for chirped mirrors. Ask RP Photonics for working out designs of chirped mirrors to meet special dispersion profiles while avoiding too tight fabrication tolerances. Due to its high flexibility, the powerful software RP Coating is well suited for designing optimized chirped mirrors. A chirped mirror is a kind of dielectric dispersive mirror with a spatial variation of the layer thickness values. Such mirrors are used for dispersion compensation in mode-locked lasers, for example. Another interesting feature of such mirrors is that they make it possible to achieve a broader reflection bandwidth than ordinary Bragg mirrors. Due to the many dimensions of possible optimization, chirped mirrors are often sold as custom optics. The basic idea of chirped mirror designs  is that the Bragg wavelength is not constant but varies within the structure (along the propagation direction), so that light at different wavelengths penetrates to a different extent into the mirror structure and thus experiences a different group delay. 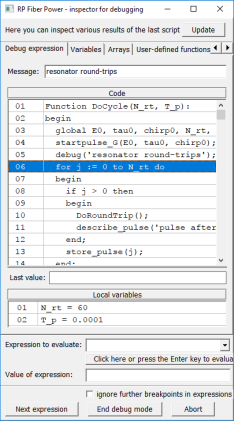 However, a naïve design directly based on this idea would not work: it would exhibit strong oscillations of the group delay and even more so of the group delay dispersion. This disturbing effect can to some extent be mitigated by numerical optimization of the layer structure, but this is difficult because the optimization has to be done in a multi-dimensional space (resulting from the large number of layers) where a huge number of local optima exist, most of which do not correspond to satisfactory designs. Figure 1: Operation principle of a chirped mirror. Light with a long wavelength penetrates deeper into the mirror structure and thus experiences a larger group delay. This leads to anomalous chromatic dispersion. There is a Fresnel reflection at the front face (the interface to air), which leads to strong additional dispersion as in a Gires–Tournois interferometer. The sudden “switching” of the coupling of counterpropagating waves from zero in air to a finite value in the structure causes a kind of impedance mismatch. The Fresnel reflection is removed with an additional anti-reflection structure on top of the double-chirped section (not shown in Figure 1). Even without numerical optimization, double-chirped designs can have a dispersion profile which relatively nicely matches the design goal. Further refinement is then achieved with numerical optimization, i.e., with fine tuning of the layer thickness values. 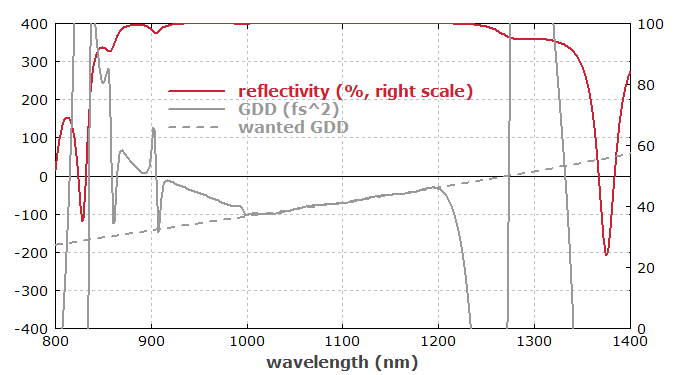 Figure 2: Reflection and dispersion properties of a numerically optimized chirped mirror design, developed with the software RP Coating. The dashed curve shows the target dispersion, which is fairly precisely matched in a broad wavelength range. 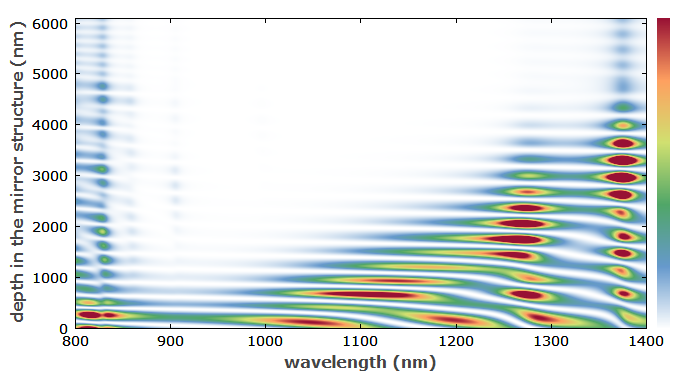 Even broader wavelength ranges are possible, when a larger number of layers is used. Figure 3: Field penetration into the chirped mirror of Figure 2. It is apparent that within the wavelength range 1000–1200 nm, the field penetrates more deeply into the structure for longer wavelengths. The larger group delay for longer wavelengths corresponds to anomalous dispersion. 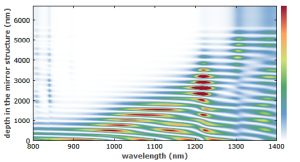 For mode-locked lasers with an ultrabroad bandwidth, as required for operation in the few-cycle regime, it is challenging to design mirrors with the corresponding ultrabroad reflection bandwidth, combined with proper chromatic dispersion over the most of that range. 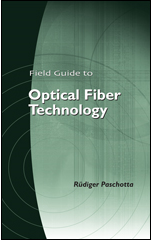 The factor limiting the bandwidth achievable is in most cases the difficulty of making anti-reflection structures with very small residual reflectivity over a large bandwidth. This problem can be solved with so-called backside coated (BASIC) chirped mirrors . The key idea of such a design is to interface the chirped mirror structure with a glass substrate rather than with air; the air–glass interface is then at a different location, and the effects of the residual reflectivity of that (also AR-coated) surface can be eliminated by using a wedge shape for that glass piece. Double-chirped mirrors (DCMs) are often used for dispersion compensation in mode-locked lasers, particularly for those with pulse durations below ≈ 20 fs. They are typically designed not only to compensate a constant group delay dispersion, but also to correct higher-order dispersion. However, there are limits concerning how much dispersion (and in particular higher-order dispersion) can be compensated with a double-chirped mirror. Possible solutions are to use a suitable combination of several mirrors, where the dispersion errors from different mirrors partially cancel each other, and to combine chirped mirrors with a prism pair. Another challenge arises from the tight fabrication tolerances; at least some of the layers typically have to be fabricated with a precision of the thickness of a few nanometers. The remaining wiggles in the group delay versus wavelength can be further reduced by using appropriate combinations of mirrors where the wiggles at least partially cancel each other. It has been shown  that double-chirped mirror designs can also be used with semiconductor mirrors. Such mirrors can generate a much higher amount of dispersion, although in a much smaller bandwidth. They can be used for compensating the dispersion in a mode-locked laser with a single compact device even when e.g. a long pulse duration requires a high amount of anomalous dispersion for soliton mode locking.